This book is one of my new favorite sci-fi novels! Just saying. It’s amazing. I devoured the book in one sitting and not just because I was stuck on an airplane. If I wanted to read or do something else, I would have. Nine-hour flights tend to provide movies and music, but I couldn’t get enough of A Conspiracy of Stars. I was actually sad when it ended. Wow, so I haven’t related to a fictional character in a while. (Pfft! I totally did three books ago.) Perhaps what I mean to say is that the exploration of the concept of home was refreshing. When most people ask me where I’m from, what they really mean is “Where is home?” But having moved around my whole life, for me it’s not always that simple. Home for me is where my suitcase is. In that sense, I relate with Octavia, the narrator. This, too, is my home. The plot was a little more slow-paced than some books, but I actually like it that way. Slower books can be pretty enjoyable, especially when they focus on excellent character development like this one. Perhaps one of my favorite themes no matter the book was also featured in this one: empathy is a gift, not a weakness. And the world-building was amazing! At first, the author, Cole, seems to throw terms at me, and I felt like I got tossed into a hailstorm with no context. Then the characters took me by the hand and guided me along, explaining things like the well-informed scientists they were. For the most part, the characters were well-developed. There’s bound to be at least one mad scientist, right? *sigh* Oh, well. I did like how smart the Octavia and her friends were. When the title finally made sense, I was immensely pleased. My main complaint was the book’s predictability. I was hoping for at least one twist at the end that I didn’t see coming. But when I was right, I silently cheered, then the book ended and how dare it! I. Need. More. In all, I gave A Conspiracy of Stars 4/5 stars for excellent world building, themes, and character but some predictable elements. I’d recommend it to sci-fi fans, especially those who liked Ender’s Saga and the Divergent trilogy. I know I said this already, but I can’t wait for the next one! Interested in A Conspiracy of Stars? Have you read it yet? You might also enjoy these books: The Shifter by Chris T. Acadian, I, Robot by Isaac Asimov, and Illuminae by Amie Kaufman and Jay Kristoff. Let’s chat! 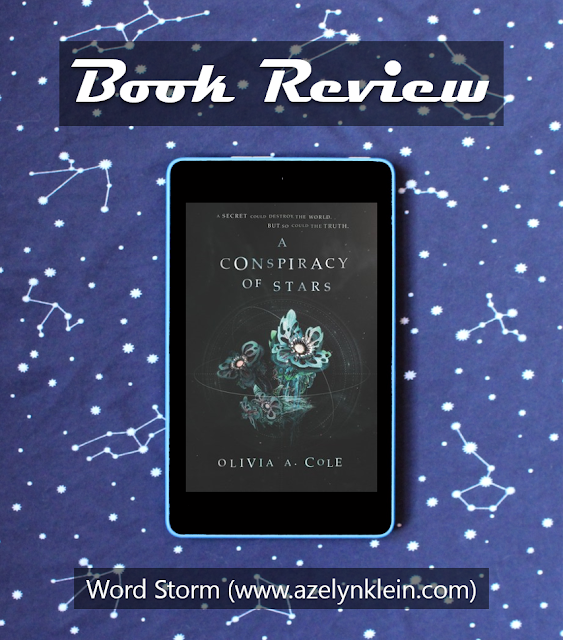 Has A Conspiracy of Stars made it to your to-be-read list yet? Anybody out there read it? Have any sci-fi book recommendations?